I now have that Hollywood smile I have always dreamed of. Dr. Wei, As an actor, my outward appearance is very important to my business. I’ve been to quite a few dentists in New York City over the years, and Dr. Wei is the only one I will go to. Manhattan cosmetic dentist Dr. Michael J. Wei proudly provides cosmetic dentistry, restorative dentistry, and preventive and general dentistry to his patients in New York City. With an eye for perfectionism and concern for the comfort and happiness of each of his patients, Dr. Wei has established himself as the go-to dentist in Midtown Manhattan. His expertise, experience, and determination ensures that your smile will be beautiful, comfortable, natural-looking, and fully functional, no matter what procedure you are having done. Your smile is one of the most important aspects of your appearance. Without white, healthy, beautiful teeth, you can miss out on professional, social, and even romantic opportunities. No matter how awful you think your teeth may be, don’t allow your embarrassment to prevent you from seeking a smile solution. Dr. Wei can help solve all your oral health problems. Your teeth don’t have to be perfect, but they should be pain-free and something you are proud of and happy to show off. If you aren’t comfortable with your smile, it’s time to visit your Midtown Manhattan cosmetic dentist and get help from Dr. Wei. 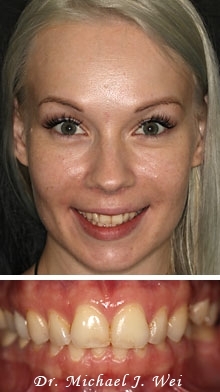 Porcelain veneers: Have you ever envied a megawatt celeb smile? Well, good news: Celebrities don’t have the monopoly on gorgeous smiles. 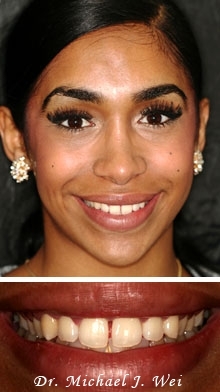 Many of those famous grins were created with cosmetic dentistry, porcelain veneers in particular. Every patient of Dr. Wei’s who opts for porcelain veneers receives veneers that are customized in size, shape, and color so they look (and feel) completely natural. Dental implants: Missing teeth can ruin not only the appearance of your smile, but also the structure of your teeth and jaw. If you have holes in your smile, your other teeth will eventually shift and your mouth could develop an unattractive compressed look. Dental implants are the secure and permanent repair for missing teeth, replacing the tooth root and serving as the base for a natural-looking prosthetic tooth. Lumineers: A less-invasive version of veneers, Lumineers offer the same amazing benefits without the drilling or sanding. Often referred to as no-prep veneers, Lumineers transform smiles without requiring excessive removal of tooth enamel. They are incredibly thin and incredibly strong for a five-star smile. Smile makeovers: The term “smile makeover” applies to any changes in your smile that make you look and feel better, younger, healthier, and happier. 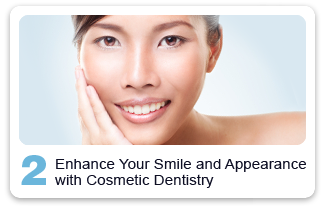 Whether one cosmetic dentistry procedure or a combination of cosmetic and restorative dentistry procedures, smile makeovers are customized to every patient. 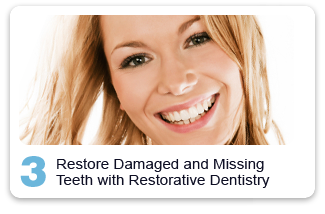 Dr. Wei will go over the options you are eligible for to restore and beautify your smile. Porcelain crowns: Damaged teeth will never repair themselves. 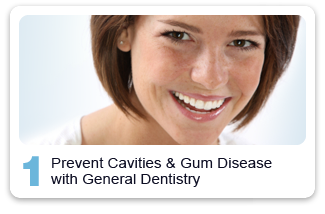 However, there are ways to cover up a problem tooth or one that has undergone root canal therapy. Porcelain crowns “cap” the tooth, protecting the remainder of the natural tooth underneath. With a crown in place, the gum and tooth root are also blocked from gathering bacteria. 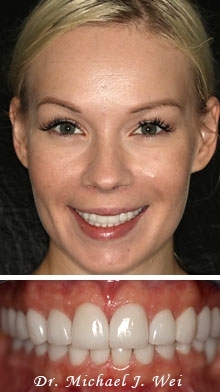 Fixed Dental Porcelain Bridges: Repair holes in your smile with fixed dental bridges. Dr. Wei uses porcelain fixed dental bridges to replace missing teeth, restoring your ability to eat, speak, and smile confidently. Cosmetic Tooth Bonding: Cosmetic tooth bonding is a fast and economical method for repairing damaged teeth. Simpler than a crown or veneer but just as effective in correcting minor chips and discoloration as other types of cosmetic dentistry, bonding can often be completed in just one visit to Dr. Michael J. Wei. Teeth whitening: Professional teeth whitening remains one of the fastest and most effective ways to transform your smile. 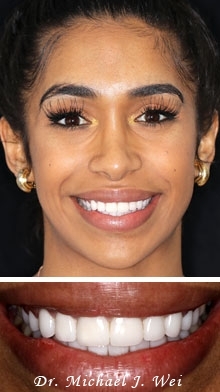 Even if your teeth are a little crooked, or there are other imperfections in your smile, sporting teeth that are 10 times whiter than usual will make you look and feel like the finest version of yourself. This procedure only takes about an hour in Dr. Wei’s NYC dental office. 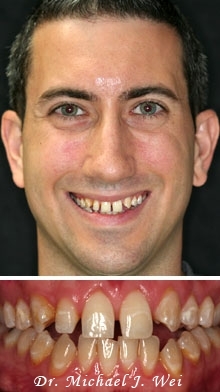 Our practice respects your time and unique smile needs. Oral health care should be a standard part of your overall health and wellness. We make it our goal to help you easily fit dentistry into your world. Our personalized dental experience is built on a standard of efficiency and dependability. We see our patients on time and we finish treatments on time. This guarantee means you can schedule dentistry into your life, instead of scheduling your life around dentistry. Enjoy a sensational smile care experience from the moment you walk in our doors and are greeted at the front desk. 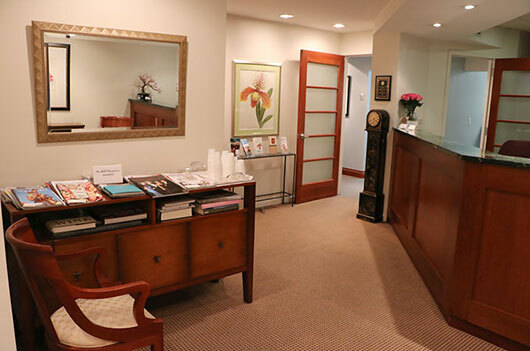 We have a private consultation room and state-of-the-art operatories, technology, and equipment to make your visit to a Manhattan cosmetic dentist convenient and comfortable. We respect that you are a discerning, sophisticated New Yorker, and we appreciate being considered to serve as your personal Midtown Manhattan dental practice. 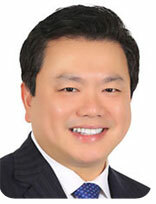 Dr. Wei’s clinical expertise and perfectionism guarantees a sensational smile care experience. Our New York City cosmetic dentistry office is conveniently located in Midtown Manhattan near Central Park. We serve patients who work or live in Manhattan, as well as residents of Astoria, Weehawken, and Long Island City. Contact our dental office today to schedule your private consultation with Dr. Wei. Read about our new patient special offer. 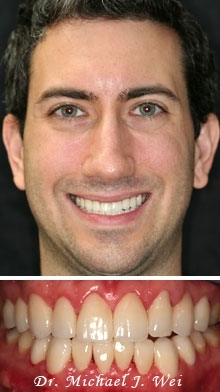 Please visit our other website: www.mymanhattancosmeticdentist.com.